What do moisture measurements tell us? – microBEnet: the microbiology of the Built Environment network. home Building science, requests for help What do moisture measurements tell us? No environmental measurement is arguably more critical to understanding the indoor environmental factors relevant to the presence of fungi or the potential survival of infectious airborne agents than the moisture measurements. Characterization of the presence of moisture on surfaces, also known as “water activity” (Aw) is the gold standard, but not currently possible without destructive testing, as is commonly done in the food industry. Content is done with probes that enter the material, and the gold standard for surface water activity in the food industry is to grind up a sample to test it. Building owners are not too happy about the pin holes in their materials and very unhappy to have the materials removed and ground up for the assessment of water activity. It is estimated approximately by indirect measurement of equilibrium relative humidity (ERH), and that may be good enough in most cases. But there are some variables that need to be considered. These include changes in temperature and absolute humidity over time, the moisture content and capacity of the material beneath the surface, and the time constants for ventilation and moisture exchange processes between materials, surfaces, and air. Then there are those episodes that introduce large amounts of moisture into the air over short periods of time as well as condensation on cold surfaces, leaks, etc. Measurements of air humidity are not controversial per se; they are quite common and fairly routine. But measurement of water activity or characterization of moisture content of interior surface materials is difficult at best and almost impossible without some destruction. While the food industry can measure water activity through destructive testing, indoor environment (including microbiology) researchers rarely have the option of destroying or damaging the surfaces of interest when they collect samples for microbiome characterization. It is common to use methods that measure the RH (ambient relative humidity)of the air or the ERH (equlibrium relative humidity) immediately above a surface material in order estimate the potential for surfaces (and the materials behind them) to support microbial growth. Many in the building industry, especially the floor covering sector, rely heavily on moisture testing before installing rolled sheet flooring, flooring tiles, or wood flooring over concrete. Wood moisture content is also important before installation of hardwood flooring or solid hardwood paneling products. Andrew Rynhart, technical director at Tramex, warns that there is an important “…difference between Ambient Relative Humidity (ARH) and Equilibrium Relative Humidity (ERH). These two completely different tests often appear to be confused.” Read more here. We opine that the material behind the surface may be storing a lot of water or none, and depending on its porosity and hydroscopicity (my new word), it may be capable of replenishing the water near the surface as it evaporates and becomes “ERH” just above the surface. So time also becomes an important consideration. Lew Harriman, one of the foremost experts on moisture measurement and one of our invited presenters at the Sloan Symposium at Indoor Air 2011 in Austin, TX, is my “go-to guy” for moisture measurement. 1. Document the instrument used (make and model and probe type and scale used) on all moisture measurements. Then there’s a chance that correlations made over time will be useful. If not done, there is a chance moisture measurements will simply confuse the research. “This applies to all moisture meters.” They all have different scales; some are more impressive than others, but the bells and whistles of the display do not mean the measurement is any better than the simpler ones. Different modes available on most models will yield different results in the same spot. 2. Virtually any “pin meter” is sufficient. Harriman recommends one like the low-budget Sonin pin meter, simple and reliable It’s not digital, so researchers don’t respect its measurements. But Harriman believes it’s just as accurate (just as inaccurate) as the ones costing $500 to $1000. 3. Harriman strongly recommends that, in addition to a pin meter, researchers invest in a Tramex Moisture Encounter Plus. Possibly the most widely-used non-penetrating meter, and Harriman reports that “it behaves reasonably consistently.” Again, he says, document which scale is being used for the measurement. He says “It’s wrong, of course… but in a consistent way–and that’s what you need for fast scans of large areas of building surface–without making two pinholes for each measurement (which building owners tend to dislike! )” The Tramex is available for about $320 from Inspector Tools. For an instrument to measure moisture content, Harriman told me he uses the GE Protimeter BLD5360 Surveymaster Dual Function Moisture Meter even though it is overpriced (>$600) for what it does, but because of its detachable pin probe on a cable, and “reasonable repeatability.” He likes that it has detachable pins and he likes the display. Available on Amazon.com for about $600, around the same price as from the low-price guarantee at Inspector Tools. Harriman recommends getting extra pins and a metal file since the pins will sometimes bend when they penetrate the material. 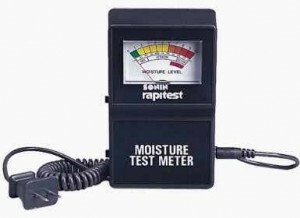 Do you measure moisture on or near surfaces? Post your comments: what do you use and what are the advantages and disadvantage based on your experience? Do your measurement reliably predict fungal growth? Then there is the question of the correlation between moisture in the air and on surfaces to the health effects of concern. Some of our most reliable informants say one should simply measure the microbes and try to correlate them with the health effects of interest. Limited work has been done in this area with mixed results. So, let us know about your experience and your opinions.